Lexmark 13400HC High-Quality Remanufactured Black Inkjet Cartridge designed to work in the Jetprinter Color 1000/ 1020/ 1070/ 1100/ 2030/ 2050/ 2055/ 3000/ Execjet II, Medley 4C Color/ Winwriter 150C printers. Also fits some Brother, Compaq, Konica Minolta, Lanier, Okidata, Olympia, Ricoh, and Sumsung printers. 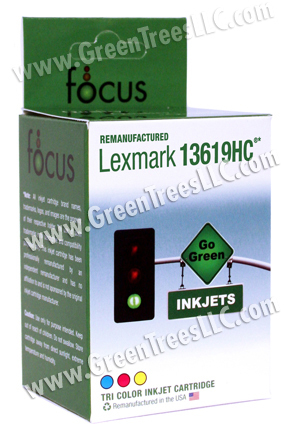 Lexmark 13619HC High-Quality Remanufactured Tri-Color Inkjet Cartridge designed to work in the Jetprinter Color 1000/ 1020/ 1070/ 1100/ 2030/ 2050/ 2055/ 3000/ Execjet II, Medley 4C Color/ Winwriter 150C printers. Also fits some Brother, Compaq, Konica Minolta, Lanier, Okidata, Olympia, Ricoh, and Sumsung printers.